Espinel and Valastro have previously pled guilty and are awaiting sentence. Villanueva, Ochetal, Lichtenstein, and Soohoo have also pled guilty in case number 16 Cr. 342 (SHS). Lichtenstein was sentenced by the U.S. District Judge Sidney H. Stein to 32 months in prison, and the remaining defendants are awaiting sentence. In addition to the prison term, DEAN, 46, was sentenced to two years of supervised release, a fine of $7,500, and forfeiture of $1,000. Mr. Berman thanked the Federal Bureau of Investigation and the New York City Police Department, Internal Affairs Division, for their outstanding investigative work in this matter. This case is being handled by the Office’s Public Corruption Unit. Assistant United States Attorney Kimberly Ravener is in charge of the prosecution. A group of Brooklyn residents helped a motorist escape a tow truck operated by the New York City Police Department (NYPD) on Thursday. Video of the incident made its way to social media on Friday when a Twitter user posted the footage in order to apparently help the NYPD identify some of the culprits. Brooklynites can be heard shouting in the video as the driver guns their minivan to break out of a set of tow bars previously deployed in the Borough Park neighborhood at the corner of 44th Street and 15th Avenue. Much of the off-camera commentary is in Yiddish but some of the taunting becomes racial–clearly directed toward the NYPD traffic agent, who is black. Another voice is somewhat more sympathetic. … Boro Park Shomrim member Moshe Steinberg Unit-22 caught on tape assisting scofflaw motorist flee from NYPD. Steinberg is also seen harassing NYPD officer as bystander taunts the officer with racist remarks. Both the Twitter and the Facebook post identify the Shomrim–a Jewish neighborhood watch volunteer group–as taking part in helping the motorist dodge the tow truck’s grasp. “I thought Shomrim was suppose to assist the NYPD?” the Twitter user asked out loud in a separate post. The NYPD issued a stinging rebuke of the crowd’s behavior. “We will not tolerate our traffic agents being subject to abuse in any form, not the least of which is the ugly example we see in this video,” NYPD spokesman Lt. John Grimpel told the New York Daily News. The traffic agent had reportedly already completed all the necessary paperwork and thus the driver’s information was collected so they are still expected to ultimately pay the necessary fine at least. They could also face additional charges. An article of LostMessiah from 2016 has been reprinted on another WordPress site, one dealing specifically with police corruption. We would like to thank the editor. If the public at large cannot count on its police force to protect it, there can be nothing more than utter lawlessness. The link to that reprint is: https://corruptionbycops.com/index.php/2019/01/13/shomrim-the-protectors-or-players-1-9/ In that article, in 2016, we suggested that many of the Shomrim had questionable motives and we found it difficult to draw straight line. In other words, we thought many of the members of the Shomrim were bent. We pose the following questions to you: when do the Shomrim cross the line between lawful protectors and mafia-style enforcers? Are they above the law because they are conveniently positioned to help their own when the opportunity to presents itself? And, are New Yorkers safe if the Shomrim are wearing uniforms suggesting they are assisting law enforcement but are in actuality terrorizing those who are indeed holding the public at large accountable. The article below is just another concrete example of a system gone utterly wrong. It proves that the hens are ruling the hen-house and nothing good can come of it. The Shomrim in the recent news article below are nothing more than criminal enforcers, thugs. Something should be done before the difference between right and wrong in the City of New York, particularly the Shomrim run neighborhoods, becomes indiscernible. An angry mob of Brooklynites pounced on an NYPD Traffic Enforcement Agent when he tried to tow their friend’s car, then harassed and taunted him for doing his job, video of the incident shows. 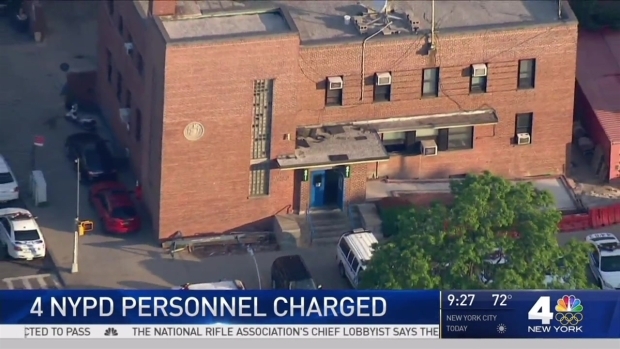 @NYPD66Pct Here is the video for your case.. since most of the community say NCO-B just hangs out inside the precinct.. Borough Park Shomrim Moshe Steinberg should be charged with OGA for assisting in this unlawful act. I thought Shomrim was suppose to assist the NYPD?? The melee began on Thursday morning in front of 1501 44th St. in Borough Park when an NYPD tow truck was dispatched to remove a brown minivan that was parked illegally. A group of angry residents quickly swarmed the location and began removing the car from the hitch, police and union representatives said. “Before the tow driver could raise the vehicle so the motorist couldn’t leave the scene people from the community… got in the car and drove off,” said Marvin Robbins, first vice president of the Local 283, which represents tow truck drivers and other city workers. Robbins said the person who got into the car was not the owner of the vehicle but instead part of a Shomrim, a collection of Jewish community watchdogs who engage in police matters and supposedly work hand in hand with the NYPD. The men outside trying to stop the tow from happening worked together to help the minivan flee — a black SUV was in front of the offending van and the men instructed the SUV to get out of the way. “That allowed [the minivan] to escape,” Robbins said. Video of the incident posted to Twitter shows the traffic agent attempting to reason with the person driving the minivan, walking up to his window to try to get him to stop before the van sped away. Then, the men on the sidewalk began taunting the traffic agent and making fun of him. “This is so great,” one guy sneered. “What a loser… This guy worked his a– off for like a half hour,” he went on. A spokesperson for the NYPD said the attack against the traffic agent was unacceptable. “We will not tolerate our traffic agents being subject to abuse in any form, not the least of which is the ugly example we see in this video,” NYPD spokesman Lt. John Grimpel said. A complaint has been filed with the 66th Precinct, and police said they have information belonging to the vehicle’s owner. He is expected to be charged with obstruction of governmental administration because he got in the way of a traffic agent doing his job. Robbins said the agent has over 20 years as a tow driver and is expected to do his job and tow offending vehicles. “This is what my drivers encounter on a daily basis out here in the City of New York… no one respects the tow truck operators,” Robbins said, adding the driver was back at work today. The agent eventually got into his tow truck and drove away. “I think that he did the best that he could, he didn’t lose it, it could’ve went a totally different way,” Robbins said.